HYDERABAD: The scientists at the Centre for Cellular and Molecular Biology (CCMB) here have identified a potential area where new antibiotics can be developed. The identification of ‘potential drug target’ by CCMB scientist Manjula Reddy and her team assumes importance as the drug-resistance in bacteria is increasing worldwide and development of new antibiotics is declining over the years. “If we have to increase the size of a room, we have to break the walls and put new bricks. Likewise, bacteria is covered with a cell wall. The cell wall is made with something called peptidoglycan. If the cell has to increase in size, it has to break what is there earlier and put new pieces. If it cannot break, cell wall cannot grow,” said CCMB Director Ch. Mohan Rao, speaking to reporters here. “She (Manjula Reddy) discovered that there are certain enzymes which break this. If we can target this enzyme and prevent that enzyme from functioning, then cell wall will not be broken. If it will not be broken, it cannot expand. If it cannot expand, it cannot survive,” he said. The study was published in ‘Proceedings of the National Academy of Sciences, USA’, a prestigious journal, he said. CCMB scientists have also made a critical discovery in meiosis, Rao said. Meiosis is a special form of cell division that splits genome in two, so that chromosome number is maintained in the embryo after fertilisation. Errors in meiosis result in infertility and birth defects and account for a majority of congenital birth defects. In plants, meiosis can be bypassed to produce clonal seeds by apomixes (an asexual mode of seed formation), which would be of immense agricultural and economical importance if engineered in crops, Rao said. Using the model plant Arabidopsis thaliana, the CCMB scientists identified a gene called DUET as the first known regulator of meiotic gene expression in plants, he said. “The work provides an initial framework that will enable researchers to further unravel the controls of meiotic gene expression in plants, as well as in other systems,” Rao said. The work was published in PLos Genetics. CCMB also contributed to a collaborative study with several international institutions on a new genetic link to body fat distribution, which was published in Nature, he said. The study identified a number of loci (regions in DNA) associated with waist-hip-ratio and waist and hip measures. It will form a foundation for future biological research in the regulation of body fat distribution, he said. CCMB scientists also contributed to genetic studies on Eimeria (E. tenella) parasites (which cause a disease called coccidiosis in poultry) and their relevance to vaccine development. “The findings indicate very high level of region-specific diversity. However, polymorphism in EtAMA1 was found to be rather less. This would facilitate vaccine development,” he said. The CCMB scientists, led by Rao, also conducted research on a nano-particle based approach for treating fungal keratitis, a major eye problem affecting farmers in India. The scientists identified specific enzymes released by the pathogen as well the host (humans). They developed a smart polymer base biocompatible nano particles carrying a formulation that is designed to handle the situation effectively. By combining the specific formulation with the smart delivery mechanisms, they have successfully treated the infection in animal model systems. The approach is being patented and clinical trials will be undertaken subsequently, according to Rao. 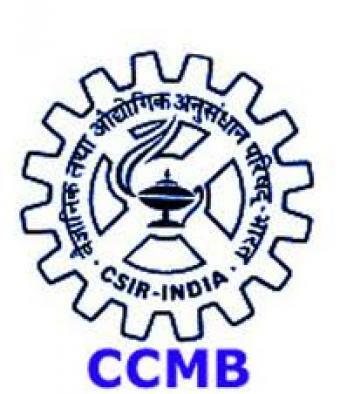 The Centre for Cellular and Molecular Biology works under the aegis of Council of Scientific and Industrial Research (CSIR).